Like all metropolises, Nairobi City has inspired a stable of clichés. You either love Nairobi or you hate it, goes one. Another, culled from the coexistence (not exactly peaceful) of mansions and slums within the same city limits, goes something like this: Nairobi, one of the world’s most iniquitous places. There is also the postcard image of a giraffe in silhouette against a golden sun at dusk in the savanna. Of the stock phrases used to explain my adopted hometown, the one about loving or hating Nairobi is my favorite. I suppose there is plenty to hate about Nairobi. The traffic is horrendous. The disparity between rich and poor is appalling. In recent years, a rash of crime has earned the city the nickname Nairoberry. Despite its shortcomings, I remain smitten with Nairobi. What started as a pit stop for railway workers strategizing how best to tackle the formidable Mau escarpment – the natural buffer between Kenya’s central highlands and the Rift Valley en route to Uganda – has grown into a lively, cosmopolitan “Green City in the Sun,” so-called because of its lush vegetation and placid weather. I first fell in love with Nairobi on a cool evening in January 1989. My father and I were travelling through the city to Moi High School Kabarak, a national school I’d been admitted to in Nakuru, 150 kilometers northwest of Nairobi. My father was in his 70s. I was a ripe 14. Naturally, being of Somali descent, we stayed in Eastleigh, a place known as “Little Mogadishu,” in a little inn called Gulled Hotel and Annex. I remember not understanding the “Annex” part. Must be one of those Nairobi City things, I thought. That night, my father sent me to buy a packet of Kol Karan (Gold Crown) milk, a popular brand produced by the Kenya Cooperative Creameries, from a small kiosk just around the corner. My rudimentary knowledge of geography failed me. I took a wrong turn and got lost. The conventional wisdom held that getting lost was not something you wanted to do in Nairobi. In my small village in northeastern Kenya, we grew up hearing stories about the pick-pockets, thieves, and murderers that haunted the big city streets. But I was not scared by the wrong turn. I was exhilarated. The city was finally mine to discover. The detour offered me, like Alice in Alice in Wonderland, a chance to explore possibilities beyond the closed doors symbolized by my protective father (the old man kept a passport-size photo of me, taken on the trip to Kabarak in his wallet, for most of the last decade of his life). I loved the perfect symmetry of the streets in Eastleigh, the splendor, the tall buildings, all of it in such shark contrast to my village back home. When I returned to Nairobi three months later, on break after my first term at school, I continued to wander the streets, past the purple flowers from the Jacaranda trees on Arboretum Drive and State House Road, on past the glitz of rising skyscrapers on University Way. I moved to Nairobi for good in 1994 to start an undergraduate degree in pharmacy at the University of Nairobi. I stayed in Hall 1, smack in the middle of Main Campus, by the YMCA, St Paul’s Cathedral, and a stone’s throw from the Alliance Francaise, a French cultural center on Loita Street, where I used to skip class to watch French films. You could say I have been wandering Nairobi ever since. As love affairs go, mine with Nairobi has been tumultuous, at turns passionate, annoying, and amusing. Some of the most pleasant surprises have come in the last decade, a decade that has seen a flowering of the city’s arts scene. A literary Nairobi has emerged, a city of poetry, performance art, and funky urban youth culture. 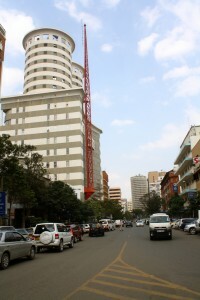 It is the Nairobi of Binyavanya Wainana, the winner of the 2002 Caine Prize for African Writing. The Nairobi of George Mungai, creative director of the Phoenix Theater, whose stage is often the setting for biting satires about Kenyan politics. 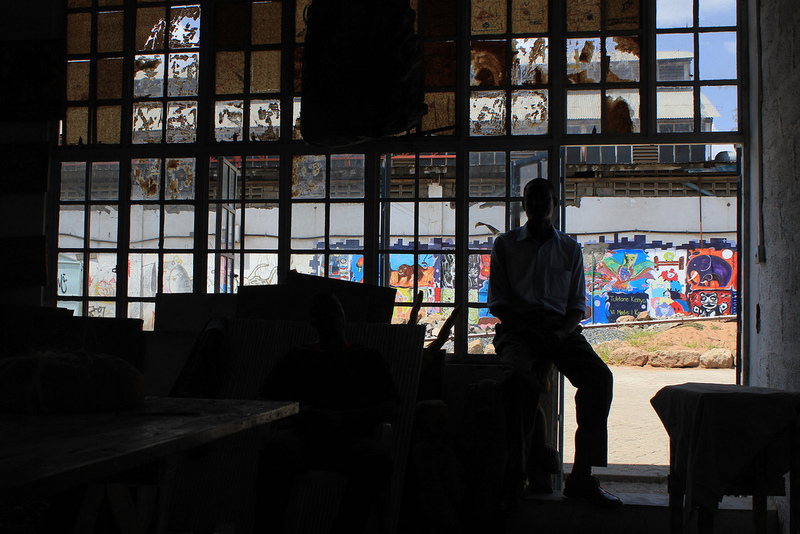 The Nairobi of Joy Mboya of the GoDown Arts Centre, a sprawling complex of private studios, classrooms, and performance spaces that also hosts residency programs for dancers, classical musicians, and artists. Suddenly, as if sloughing off the residue of the previous regime – a regime whose conflation of art and propaganda in choreographed mass choir performances seemed to take cues from Pyongyang – Nairobi wants to express herself. Coffee houses with punchy names (Dormans, Java, Savannah, the Mug) have sprung up in the central business district, in Hurlingham, in Upper Hill, and in Weslands. There are monthly poetry recitations, short story competitions, ribald theatrical productions. During Solos and Duets, a contemporary dance festival held every fall, it is not unusual to see a young man contorting himself to the pluck pluck of a plaintive Oromo tune from Ethiopia, a sight that would have provoked chuckles of incredulity a decade prior. Then there are the youth, walking mannequins wearing the latest Mohawks, black-and-white Arafat scarves, and skinny jeans. They live for the weekend. They emanate a buzz on furahi-day, a word play on Friday, furahi meaning “happy” in Kiswahili. They move with a certain swagger, a lightness of step and spirit not out of keeping with the feeling that buoyed me through the streets of Nairobi on that lovely night when I got lost on a milk run for my father all those year ago. The truth is I still feel the excitement and bewilderment I felt for Nairobi back then. Meandering through the streets today, it feels as if I’ve only just begun to discover this place. It still feels like something spectacular is just around the corner. Abdinasir Amin is a writer and essayist in Nairobi. He can be reached at nasirke@yahoo.com. To view more photographs from Kenya by Fabian Alonso (fabian@assaltocultural.org), click here.